Find hotel near Mount Albert Aquatic Cent .. The Mt Albert Aquatic Centre is a modern facility that offers swimming lessons by highly trained professionals. The place also offers modern workout classes that take place in the pool for people of all ages. The wave pool and the water slides will make sure your children have a good time while a causal swim here is just as rejuvenating. The place also has an in-house space and a small cafe to grab a bite later. Carry your swimsuit and towel with you along with other swim gear that you may need. For other prices, visit the official website. 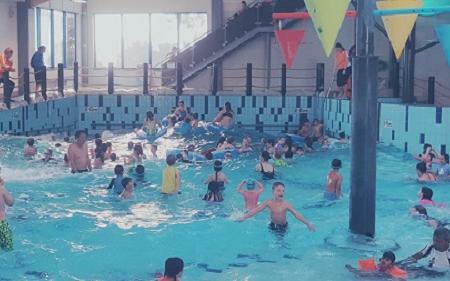 How popular is Mount Albert Aquatic Centre? People normally also visit Auckland Zoo while planning their trip to Mount Albert Aquatic Centre. One of the best swimming pools on Auckland. You will love the atmosphere out there. So clean and specious. The swimming school offers different classes on weekdays and weekend. The instructors are good except one or two. However, good part is that you can change your timings that are aligned with other teacher's classes. The staff and it's customer service are great. Polite and good listeners. The bathrooms are clean and have all the facilities. Cool pool, haven't been since it was pirate themed so the decor is a little boring now. Pool was nice but could be warmer and the waves didn't go for very long which was a shame. Pretty pricey too. Ideal place for a family time. Temperature controlled pool is amazing to swim in in any weather. Cool down with a sip in the in house cafe. Forgot swimware? Get from the the front store. Jacuzzi and spa refreshes the mind. Waves not that great as popular for and is only for a short duration. Overall a good and clean place. It was really cool for the kids with the wave pool and being able to jump off and do bombs . They loved it, for me i wish there was another pool to just swim around in. It was so packed that just about every 30sec i was splashed in the face and all i wanted to do was relax in the pool. Over all though it was a lovey place.